For use in hospitals, nursing homes, health care facilities, barber shops, beauty shops and hairstyling salons. Anti rust formula. Kills HIV-1 (AIDS Virus) on precleaned environmental surfaces/objects previously soiled with blood and body fluids. Kills Staphylococcus Aureus, Salmonella Choleraesuis, Pseudomonas Aerguginosa, Herpes Simplex 1 & 2, and Trichophyton Mentagrophytes. 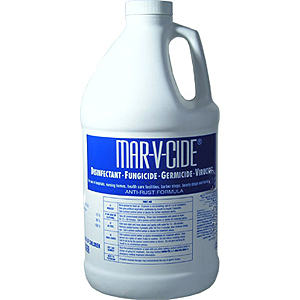 This product is not to be used as a terminal sterilant/high level disinfectant on any surface or instrument that (1) is introduced directly into the human body, either into or in contact with the bloodstream or normally sterile areas of the body, or (2) contacts intact mucous membranes but which does not ordinarily penetrate the blood barrier or otherwise enter normally sterile areas of the body. This product may be used to preclean or decontaminate critical or semi-critical medical devices prior to sterilization or high level disinfection. n-Alkyl (50% C14, 40% C12, 10% C16), Dimethyl Benzyl Ammonium Chloride.